SODOPAC has been producing ranges of different products under their distinct brands for large retail chains and for their network of individual footwear retailers for over 15 years. CARREFOUR has selected SODOPAC for the specific features of their soles and their capacity to develop a range of specific products to meet the expectations of their customers and the particular requirements of their TEX© brand. With their AIRPLUM© brand, SODOPAC offers their network of Footwear Retailers two collections per year (summer and winter), which are continually enriched with innovative models in new materials and colourways. 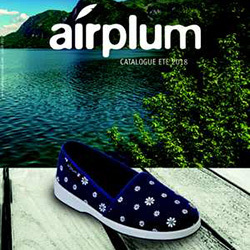 While preserving tradition with the Charantaises models for which the company became famous, the collections of SODOPAC products are highlighted and promoted under the French manufacturing brand AIRPLUM. At the request of our partners, and based on their needs – importers or our wholesaler partners, SODOPAC is capable of offering products from the seasonal collections or products manufactured to specification under their customers’ brand names; we currently produce for the Chinese market under the DIAN© brand, and for the USA for the Style Of Paris© brand. Under the AIRPLUM© brand, you will find all the models manufactured in the Perigord factory. The models boast patented polyurethane foam soles, which provide lightness, a soft texture, unparalleled longevity in terms of cushioning, and thermal insulation, as well as the traditional twin-layer Charantaises, which offer insulation, comfort and durability. From the 2017/2018 winter season, you’ll also find specific models of slippers and mules for men and women manufactured by SODOPAC in the Swiss supermarket chain MIGROS, under the ELLEN AMBER brand name. For the next season of this winter of 2018, CORA, a major player in the distribution of the East of France but also Belgium, wanted to promote with its brand INFLUX ©, the know-how and quality of French manufacturing. SODOPAC is particularly proud to have been selected by CORA for the manufacture of its new range of mules comfort woman and man equipped with our patented sole ultra-comfort polyurethane foam shape memory.